The Machete Kills promotional campaign appears to be kicking into a second gear. One would think that Robert Rodriguez was prepping his grindhouse sequel for a summer release, and not September. Recently, we threw up a link to a Spanish trailer for the bloody vengeance film. 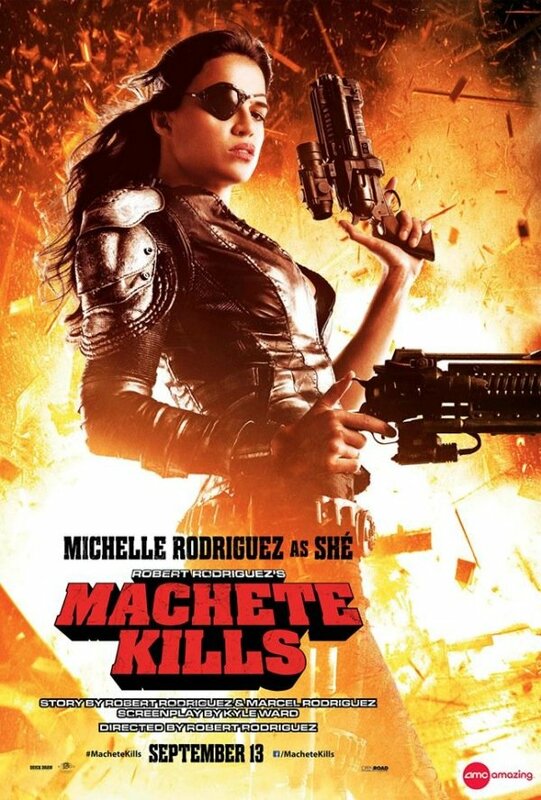 And now, Michelle Rodriguez contributes to the character-poster phase of the campaign. The above one sheet just landed on the film’s AMC Theatre’s Facebook page. Rodriguez will play She in the sequel, which means (I suppose) that she’s different from the character of Luz in the 2010 original. In true sequel fashion, Machete Kills is implementing the plan of escalation, pitting our hero (Danny Trejo) against an “eccentric billionaire arms dealer” who has an elaborate global plan to take over the world. Oh, that’s all? Rodriguez certainly knows a thing or two about franchises with escalating plans. She came back from the dead recently to rejoin the lucrative and hard-hitting Fast & Furious franchise, playing Letty. She likely will still be on board for Fast 7, which will be in theaters next summer. Now that’s fast. Maybe they are doing so many character posters early because there are SO MANY characters to tease in the upcoming sequel. As the Spanish trailer teased, Trejo will be joined on screen in Machete Kills by Jessica Alba, Sofia Vergara, Amber Heard, Charlie Sheen, Lady Gaga, Antonio Banderas, Alexa Vega, Vanessa Hudgens, Cuba Gooding, Jr., William Sadler, Marko Zaror and Mel Gibson. If all of them get a character poster – and they should – then that’s the reason we’re starting in June!